A New Day: Earth Day - Everyday! What its about and why its for Everyone. Earth Day - Everyday! What its about and why its for Everyone. Ah Earth Day! On of my favorite non-traditional-holiday Holidays. or button (not my design, not my sale!). 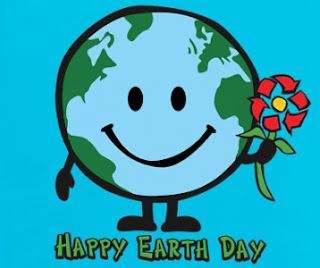 Did you know that Earth Day began in 1970 as a day of learning created by United States Senator Gaylord Nelson of Wisconsin? Nelson, after seeing the damage done by a 1969 massive oil spill in Santa Barbara, California, was inspired to organize a national day that focused on educating the public about the environment. He wanted to raise awareness of nature and how we can work to preserve her natural beauty. It is now an annual holiday that is celebrated on April 22, not only in the United States but in many other countries. Everything we do makes a difference. Going to plant trees this past weekend was one way that we contributed, and its an easy way to make a big difference! (Not to mention, very fitting, since the 2016 theme is Trees!) Other easy ways: reduce your consumption, don't litter, recycle, and encourage others to do the same. My personal contribution this year is a re-commitment to my Nothing New project. Our consumption habits make such a difference, either positively or negatively, on the environment. I'm making the choice to make my efforts be a positive one. There is this funny idea that caring about the Earth and wanting to protect her is a hippie thing, a pagan thing, a weird liberal thing. But the truth is, it has to be an everyone thing, because it is about survival! We have but one planet and our current level of consumption and destruction is unsustainable. There is a reason for everyone to care! Christians (and many other religions) are charged with protecting what God created for us. Economically it makes sense for us to be more energy independent. Parents can all agree that we want to leave our children and grandchildren a place to live as beautiful as what we have. Whatever your reasoning, whatever your level of celebration today, I hope that you have a beautiful Earth Day 2016!! Find events near you and more about the Earth Day organizations work, Here.